Home What’s the going rate for windows and doors? What’s the going rate for windows and doors? Gary Warby, Managing Director Premier Windows, explains why some home improvement discounts should be treated with a pinch of salt. In the summer Zenith Staybrite Ltd pleaded guilty to ten offences under Consumer Protection from Unfair Trading Regulations following an investigation by Buckinghamshire and Surrey Trading Standards*. Within this were five offences of taking part in an unfair commercial practice by quoting an initial high price before applying a number of discounts to give the impression of a bargain. The firm also pleaded guilty to five counts of engaging in an unfair commercial practice by falsely stating that products would be available at a particular price for a limited time to persuade customers to make a decision on the spot whilst under pressure. One gentleman was initially quoted £52,120 for a replacement set of uPVC windows, fascias and guttering before a collection of discounts were applied giving a final price of £22,362. And they aren’t alone. There is a long list of double glazing companies, who have found themselves in hot water for unfair commercial practices. So this raises the question, how much is a realistic price that you should you pay for double glazing? Well we wish we could give you a simple answer, the problem is we can’t but we can give you a steer and what to look for but unless you have a very large house – new windows should never cost £50,000 plus! We will confess, we’re window ‘geeks’, but there is a huge difference in quality between the different window systems that your new windows could be made from. A white PVC-U energy efficient window, may look to the naked eye more or less the same as the next other than perhaps differences in style but it can perform very differently. Ask about its Window Energy Rating (WER). This gives a measure of performance based on a simple colour coded scale in the same way as white goods running from ‘A’ to ‘G’. Always choose a window system which has decent fixing points for hardware – a key factor in the security of your new PVC windows and doors. 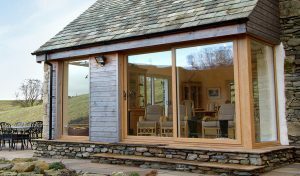 Our energy efficient, low maintenance and high security windows are manufactured in Optima, a high quality six chamber energy efficient system from Profile 22, a British-owned and based systems company. Tip #2 Glass – look further than clarity! Judging glass may not be easy, but if you know of the key factors to look for, you will be fine. It’s a big factor in price. If you’re getting wildly different quotes, do a little research. Your new windows should last for the next 20 years or more so make time to get it right. All of the double and triple-glazed glass units that we supply our done so through our glazing partner Pilkington. These use smart low-e coatings on glass – a one-way door for trapping and holding energy. We also use warm-edge spacer bars which separate the sheets of glass in double and triple-glazed units to put ‘space’ between the cold air outside and warm air inside, insulating it in the process. New windows usually feature multi-point locking system and anti-burglar handles and hardware but as always there are cheaper specifications on the market which won’t deliver the same high levels of security as quality systems. Our windows feature eight-point locking as standard and nine point locking on larger window sizes. As well as locking the window along the sash, our heavy duty multi-point locking system provides a dedicate fix in corners. These have been Independently tested to 6,000N force – more than double the requirements set out in the BSI 7950 Security test. All of the composite entrance doors that we supply are also police accredited Secured by Design as standard. As with any other sectors, there are too many window companies that are ‘here today and gone tomorrow’. Choose a company with an established reputation locally and if possible speak with friends to see if they have any recommendations. Tip #5 If it seems too good to be true, look into it properly! There is usually room for negotiation but unless we’re being offered some incredible discounts of our own by our suppliers, the level of offering a 60 per cent discount is just not possible. We couldn’t stay in business. We’ll always try and work with our customers to keep costs to a minimum but also always start at a realistic price point. We don’t offer huge discounts but we do offer great value and the peace of mind that goes with purchasing from a successful business. Like anyone in business, we’re here to make a profit but not rip our customers off. For more information email enquiries@premwindowsanddoors.co.uk or call a member of our team on 01296 422 842.